No, Grandma wasn’t Swiss. So far as I know, this recipe isn’t, either. Nor is it a steak. It is one of those good old fashioned homey things to do with a relatively cheap cut of beef… a variation of a pot roast, really. I have absolutely no idea where the name came from. Swiss Steak is basically a pot roast that is floured and browned, then simmered with tomatoes. The flour helps give it a nice dark brown crust. You pound in the seasoned flour to make it stick. There is a theory that this pounding will also tenderize the tough meat – but a meat mallet doesn’t really do anything to a thick roast, though it will tenderize thin cuts. Grandma didn’t have a mallet – she just used the edge of a saucer to pound in the flour, and it worked perfectly well. 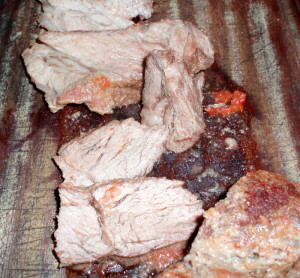 You want a slab of meat, rather than a chunk – which is probably where the “steak” comes from. This is 1 pound, 12 ounces of chuck. I’d go with anything from 1 1/2 to 2 1/2 pounds, of either chuck or round, in a piece 1 – 2 inches thick. Make sure it fits in your pan, with enough room to brown it. 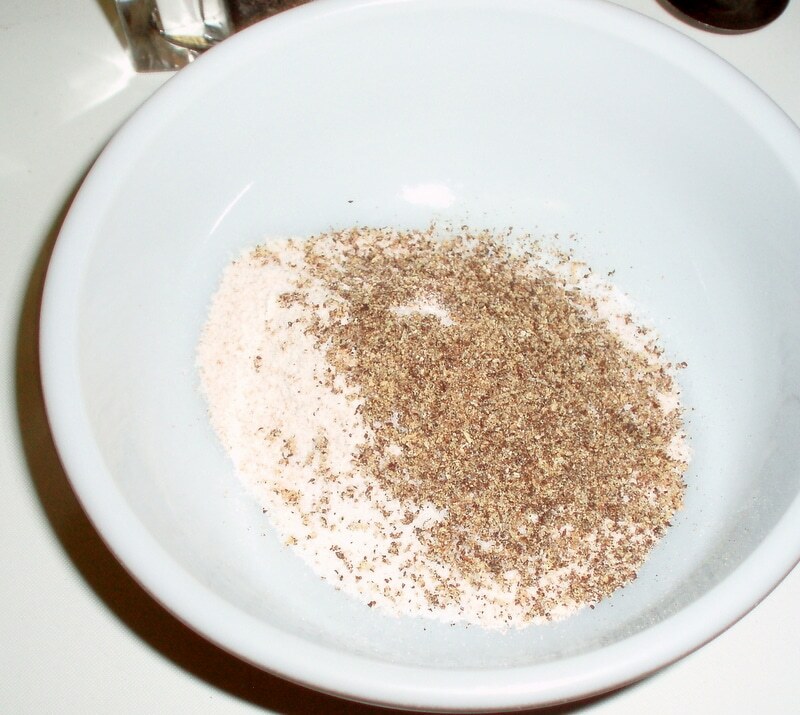 I would usually just scoop flour into a bowl, but I measured out 2 tablespoons for you – and had a fair bit left over. So, something a little less than that, probably… Then I added about 1/2 teaspoon of salt. I grind my pepper freshly in a peppermill (and refuse to try to measure that!) so – grind in some pepper… I could have used more than this, really – I like pepper. I poured some of the seasoned flour over the meat, and rubbed it in with my hand. I have a meat mallet, so I used it to pound the flour into the meat – as I said, Grandma used the edge of a saucer, or a small plate, and that worked. 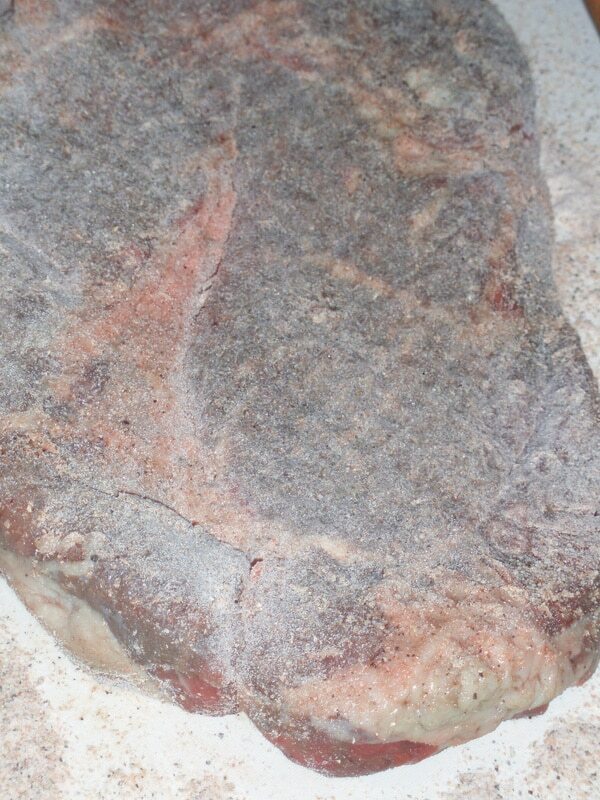 I rubbed and pounded, rubbed and pounded, on both sides, until the meat was well coated with the seasoned flour. I took a large enameled cast iron pot. You don’t need that, of course, but do try to use a heavy pot that will take and keep an even high heat. Grandma used a beautifully seasoned cast iron frying pan – so well seasoned that the tomatoes weren’t a problem. 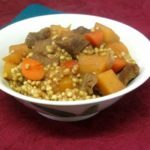 I still have it, but I don’t use it enough, and it’s not as well seasoned any more – acid foods, such as tomatoes, pick up too much of the iron, and, when simmered, leave you with a metallic taste. 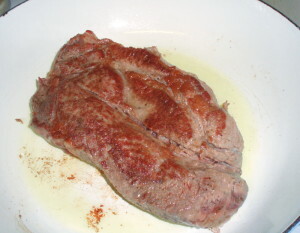 The cast iron is ideal, though, for the browning step – if you want to, you can brown the meat in cast iron, and transfer it to a non-reactive pan. I don’t want to use two pans if I don’t have to. Once the second side had browned enough, I added a can of diced tomatoes, with about a tablespoon of water to rinse out the can. I brought the tomatoes to a low boil, lowered the heat until it reached a gentle simmer, and covered the pan. I checked it occasionally, to make sure it continued to simmer gently – if it is too high, the meat will be tough. I let it cook an hour and a half, then removed it and sliced it across the grain. Think of the meat as having a grain like wood – if you cut with the grain, it will be tougher than if you slice across it. (I’m not sure the picture is clear…) That’s the reason for the classic London Broil diagonal cut, and it works for any less tender cut of beef. Equally, I realize I should mention, you want to cook any pot roast or stew until the meat is well done. Rare beef only works with the tender cuts – the tougher, but more flavorful ones tenderize with slow cooking, and need to be thouroughly cooked. 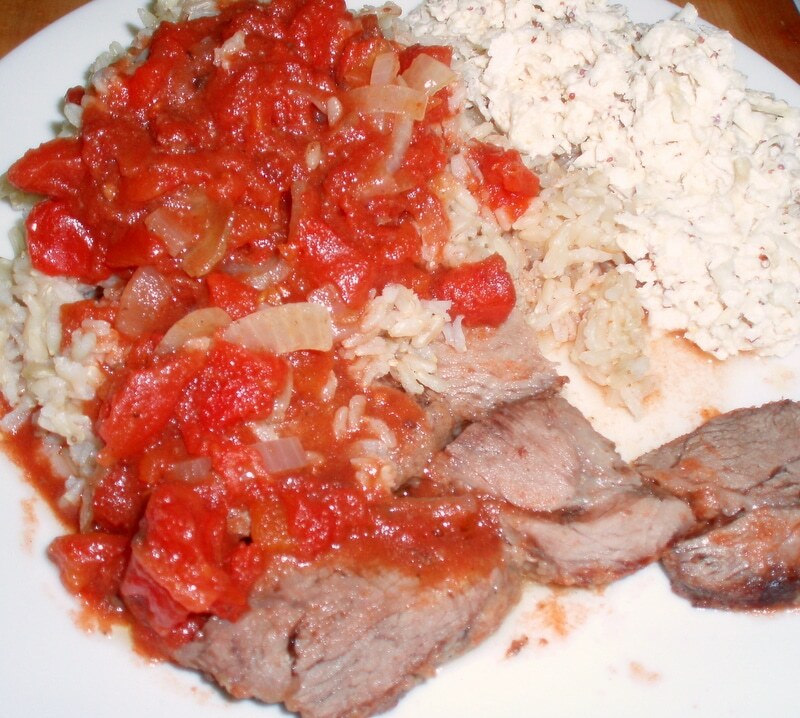 I served slices of beef with the tomatoes, over rice, with some of my celeriac salad. Since there are only two of us, we had plenty of leftovers… I’ve reheated the same combination, we ate tomatoes with other meats, I cut the beef up in bite sized pieces and added it to beans and soup – and I still have some left. 1 chuck steak or round - 1 1/2 - 2 1/2 lbs. Trim excess fat from the meat. It will still be marbled, and that's fine, but you don't want a big chunk on the edge. Rub the seasoned flour into the meat,and pound it in, so the meat is well coated. Heat the oil in a large heavy frying pan. Brown the meat in the oil, 3-5 minutes on a side, until it is well browned. Add onions, stir in oil, cook until starting to soften. Add tomatoes. Bring to a low boil, then lower heat to a simmer. I think you are going to need a lot more seasoning/herbs/spices to add flavour? Looks very tomato heavy to me? Browning the meat brings out a depth of beef flavor - it's really not that bland, especially if you use enough fresh pepper. 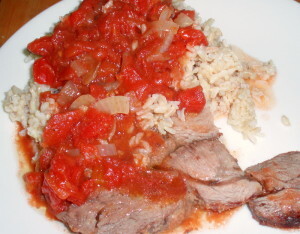 The proportions of beef to tomatoes vary a bit - I had a smallish piece of meat and a large can of tomatoes - if you used a 2 1/2 pound piece of beef and a smaller can of tomatoes, it would be different. And the tomatoes do add an acid bite, which balances the umami caramelized beef flavor. But of course you can add more seasoning, if you like - it will just be a different dish, though tasty, I'm sure. 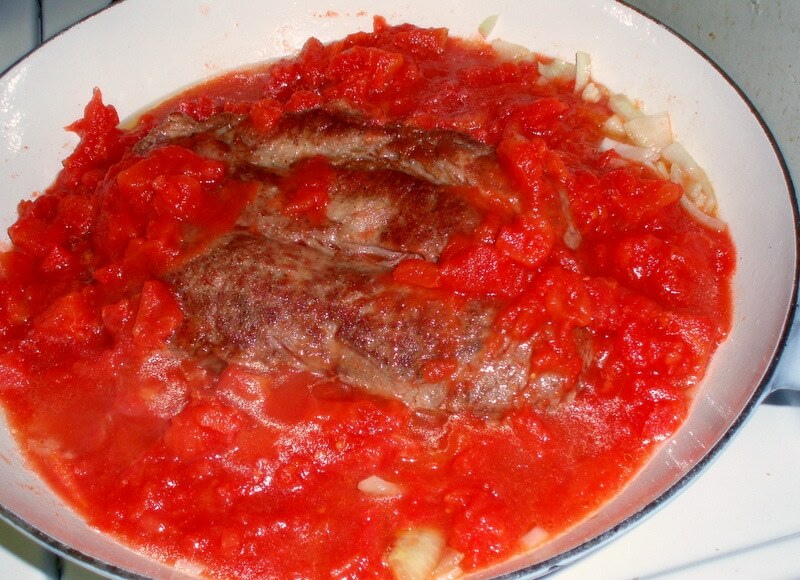 This is the recipe known as Swiss Steak in the second half of the 20th Century in the US. 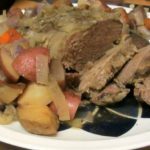 A wonderful pot roast with fewer tomatoes and more seasoning would be a wonderful pot roast - I've made that, too - but not a Swiss Steak... Sometimes its good to go back to basics, and remember classics. The bottom line is - when you cook for yourself and your family, you season dishes the way you will like them. Hot peppers would taste good (well, I think they taste good in almost everything, but then you might want to cut the black pepper,) you could go for a basil/oregano Italian feel, or bay and savory, more like a beef stew... whatever you like, and it will also be good. But it won't be Swiss Steak. Sorry should have added #RecipeoftheweekGood tips for using leftovers too. It would absolutely work in the slow cooker - but do make sure you brown the floured meat first. That makes a big difference in flavor. (That's a great time to use the cast iron pan, if you have one!) Thank you!